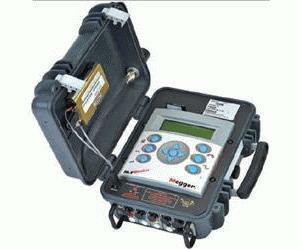 The new Megger PA9 Wireless is the latest innovation of the successful PA-9 Power Quality Analyzer platform. It simultaneously records power quality and power flow information. The PA9 Wireless incorporates newly enhanced key features including a wireless modem for remote communication, a full 12 MB of nonvolatile internal memory and standard auxiliary power input capabilities as well as an optional external flash card for added memory. The wireless modem allows the user to configure the unit remotely, view real-time data via the remote screen, and preview all recorded data without downloading the data. The software can be programmed to automatically poll the unit periodically, so all the data can be present on your PC when you arrive at the office. The unit can also be configured to send out emails in the case of a SAG, SWELL or transient event. The PA9 Wireless records power quality and power flow information simultaneously. The recorded information can be viewed via the built-in graphics display or downloaded to a computer using the serial interface, the wireless modem or it can be transferred to the optional removable flash memory module.